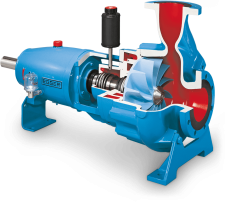 Since 1947, Egger has been producing centrifugal pumps and control valves in Switzerland for challenging applications. The entire development and production, including final quality control, is done in Egger’s proper workshops. By maintaining its standards and norms, Egger guarantees continued improvement of its service and general performance. In this way, Egger provides a continuous amelioration of its processes and assures a professional and high quality finished product. In the course of manufacturing, individual parts and components are subject to tight controls. The final assembled and operation-ready pump will then be exposed to real-world operating conditions in the testing department. On the test stand, the performance of the pump will be checked with water as the test fluid. This reality-simulated test produces especially meaningful measured values, in contrast to purely mathematical checks. Egger tests its pumps against tolerances and procedures meeting internationally recognized standards and in accordance with petrochemical standards.